In Italy the Festa della Repubblica (republic day), which has been the national holiday of Italy since 1946, marking the ends of both Fascism and the Second World War, is celebrated on June 2. This year the Mayor of Genoa, Marco Bucci, will be visiting San Francisco to honor the occasion among this city’s Italian residents (including those of Italian descent). 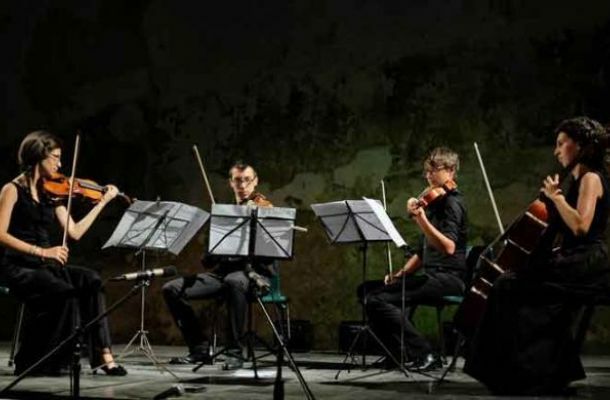 The Italian Cultural Institute (Istituto Italiano de Cultura, IIC) will contribute to the occasion by hosting a double concert to pay homage to the city of Genoa. This will be a “double” concert because the program will be divided between two separate ensembles. One will be the duo of violinist Andrea Cardinale and guitarist José Scanu. While the guitar tends to be associated with influences from the Iberian peninsula, both Gioachino Rossini and Niccolò Paganini composed duets for this pair of instruments. Both composers are part of the Cardinale-Scanu repertoire, which extends forward in time to the present day. The other group will be Quartetto Dàidalos, founded in Novara in October of 2014 by four friends with a shared desire to explore the chamber music repertoire. Those friends are violinists Anna Molinari and Stefano Raccagni, violist Lorenzo Lombardo, and cellist Lucia Molinari. As might be suspected, their repertoire includes both Ludwig van Beethoven and Franz Schubert; and, because they are Italian, it also includes Giuseppe Verdi’s only string quartet. This concert will begin at 6:30 p.m. on Tuesday, June 5, and will probably last for about two hours. IIC is located in the Civic Center at 601 Van Ness Avenue, Suite F. Admission is free, but registration is required to assure having a place. IIC has created a registration page specific for this event. Anyone who registers may also add the names of a maximum of two additional guests. Those wishing further information may call IIC at 415-788-7142.